We are lucky to have two Moroccan shops in Walthamstow – Maghreb on Hoe Street and Bella Halal Butchers on the High Street. Both have good butchers and make their own merguez sausages; chicken, lamb or beef, all products are halal. Last week I was surprised and endeared by the owner of Maghreb telling me to pay him later when I didn’t think I had enough cash on me and they only take card payments over £10. I’ve chosen to serve Moroccan food for my Supper Club so wanted to try a variety of different breads to go with a spicy pumpkin soup. 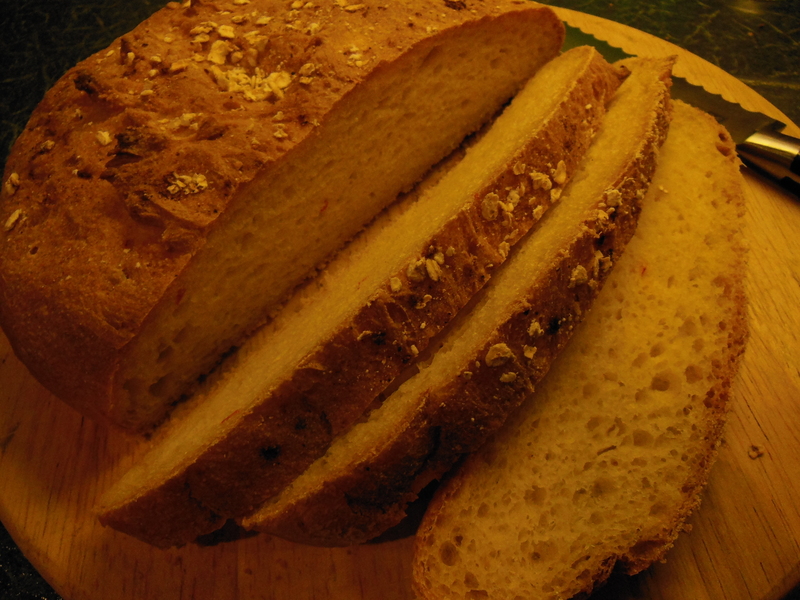 This week inspired by Paul Gayler’s book ‘World Breads’ I decided to try Spiced Moroccan Kesra – this is a wheat and cornmeal loaf made with herbs and spices perfect for tearing and sharing. I’m proud of how well the bread turned out, have some other ones to try but Kesra might make a guest appearance! Tip the dough onto a floured surface and knead vigorously for 5 minutes. It was a light dough so this was quite easy. Place each loaf on a greased baking tray, cover again and leave to rise for another 45 minutes. Bake for about 30 minutes until golden brown and the loaves sound hollow when the bottom is tapped. If you can wait, leave them to cool before slicing or tearing into; eat with soup, dips or stews and tagines. This entry was posted in Recipes, Shopping in E17 and tagged bread, dough, Flour, Kesra, Maghreb, Moroccan bread, Moroccan shop Walthamstow. Bookmark the permalink.